A stack o’ books. 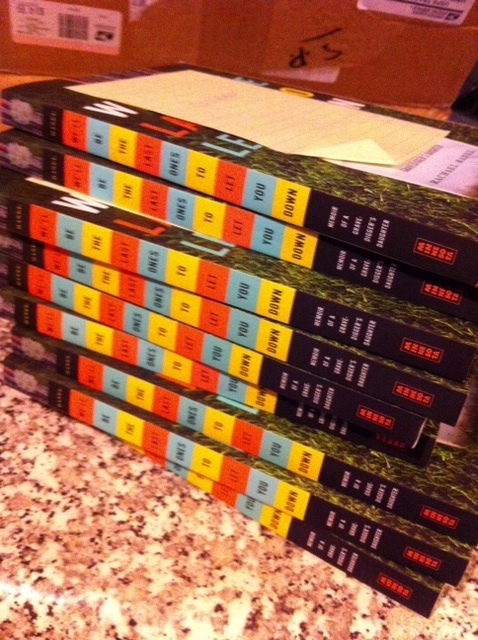 I still love the spine that the U of MN Press came up with for my book. I’ve visited several book clubs that have read my book, many recently in the months of August and September. Have I mentioned how much I enjoy book club visits? I’m happy to do these either in person (within reasonable driving distance) or via Skype. Wednesday’s discussion at Mankato’s Unitarian Universalist Fellowship was a particularly robust event. For one thing, about 20 people showed up. Wonderful! And I so much appreciated how carefully everyone had read the book and the intelligent questions that resulted. A memoirist’s main ambition is (or at least, should be) that the reader take the story and apply it to his or her own life. The book ceases to be about the author and becomes more about the reader. I’m gratified when readers tell me that my book prompted them to think about the losses in their own lives and how they dealt with them. The book also prompts readers to share with me their experiences with cemeteries. I think most everyone has a relationship with cemeteries, whether they love them or try to avoid them. One woman told the story of her own father’s death when she was 13. He’s buried in a cemetery that she grew up playing in with her cousins. But the moment her dad was buried there, the cemetery took on a very different meaning. It still bothers her to this day that he’s there–to her, she doesn’t feel that her dad is really part of that place. How many of our loved ones are buried somewhere simply because that’s the last place they had lived? It’s always nice to see Waseca represented in a crowd! One gentleman was a 1959 graduate of Waseca High. One woman’s daughter and grandchildren lived in Waseca for several years. I recognized one woman right away, even though I hadn’t seen her for 20 years. Upon entering the room someone called her by her first name and then I knew for sure! “You’re a Haley, aren’t you?” She laughed and said yes! Is Waseca the only place in which you can pick out members from entire families at just a glance? I’m thinking of the Haleys (of which you can easily differentiate the brown-haired Haleys and the blond-haired Haleys), the Hoehns and the Byrons. And the woman whose family was the victim of a terrible tragedy several years ago. Her face also was familiar and when she said her name, I instantly knew who she was. She bravely shared the story of the tragedy with all of us. I told her I visit those graves every time I’m at Woodville because they are not far from my dad. It seems without a doubt that Waseca has an inordinate number of terrible deaths compared to its population. Of course, I pay close attention and know when something happens, but even when I try to be objective it seems like a crazy high incidence of tragedy. Even a town the size of Mankato does not seem to have the abductions, murders, and teen car accidents that Waseca seems to have every 2-3 years. Thank you, Unitarian Universalist Fellowship of Mankato, and especially Linda Good for inviting me! I had a great time! Very interesting. And something I understand–it’s difficult for a society to let their children go (to be educated) when they believe (and not always incorrectly) that their children will learn to denigrate or despise them.